The medicinal effect of St John´s Wort or Hypericon Perforatum, has been known and documented for centuries. Over time, it has been recommended and used for a cohort of ailments, conditions and diseases. For many years its effect was attributed to astrological and occult powers. 1652 Nicolas Culpeper, who used the old astrological medicinal system, wrote in Culpeper´s Herbal (Culpeper Nich 1652) (1) about St John´s Wort´s beneficial effect on the gall, the liver, its effect against women problems, (not problems with women), about its beneficial effect on the mood, and an almost endless list of other sufferings. St John´s Wort was for centuries cultivated in Europe and in countries where European monks.. It is still found in the gardens of many old monasteries. St John´s Wort has a documented effect in the treatment of depression, but its use can have unwanted, even lethal consequences. St John´s Wort for Depression – Yes But ! St John´s Wort is often used in herbal alcoholic drinks. It taints the “spirit” with a pleasant red color. The most common and best documented use of St John´s Wort is its use as a remedy against melancholia or depression. Today, we have a better understanding of the plants active ingredients, its medicinal effect, as well as the risks as we had during the time of Culpeper. With regard to the modern “over the counter” sale of St John´s Wort as non-prescription drug or as a food additive it is worth noticing, that the monks of centuries past, and others who were trained in pharmacological and medical skills, were, in spite of many superstitions, highly qualified for their time. Also others used herbs with caution and not without knowledge and consideration. Herbal remedies were generally administered by people who had the necessary pharmacological skills, who knew the growth conditions of the herb and much effort was made to secure a standardized quality of the product. Today´s over the counter sale of medicinal herbs can easily make us believe that the products are harmless. Rather than restrictive laws, what is needed, is to make unbiased information available to both health-care providers and those who buy the product over the counter. The flower of St John´s Wort looks pretty. Its easy to forget that it can cause severe side-effects, such as the rejection of implanted organs. If it is used together with certain other products, there can arise serious problems, such as unwanted pregnancies. Even though St John´s Wort products can be freely bought over the counter in many supermarkets and stores, there is an acute lack of unbiased and detailed information. The herb is widely used as a remedy against mild to moderate depressive spectrum disorders. 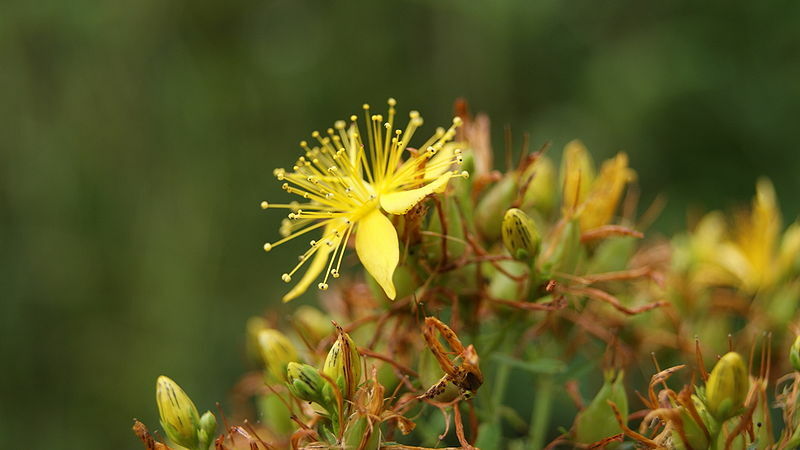 The active ingredients in St John´s Wort are comparable with other SNRI/SSRI medicines – happy pills – anti-depressants. It is commendable to use the same carefulness and responsibility with St John´s Wort, as one would use with the synthesized SNRI / SSRI medicines. Before using it against depression or other mood disorders, I recommend to consult a medical doctor and/or a clinical psychologist. St John´s Wort, Yes……. But ! Before considering whether to use St John´s Wort or not, let’s have a closer look at the plants known active substances, the justification of its use as a remedy against depressions, and a look at its metabolism, its interactions, and not least, at the known side-effects and the risks which are correlated with its use. Hyperikon Perforatum contains a cohort of different components, but the primary active components are naphthodianthrones. The most biologically active naphtodianthrones in St John´s Wort are pseudohypericine and hyperforin. The herb also has flavones, xanthoids and quercetine. One of the biggest problems with the pharmacological use of Hyperikum Perforatum is, that there are significant variations in the content of the active substances in different products. A study by Draves and Walker (Drawes & Walker 2003)(2) analyses the content of naphthodianthrone in 54 different St John´s Wort products on the Canadian market.The study documents, differences between the declared content of naphthodianthrone and the real content; from 0 % to 109 % for capsules and from 31 % to 80 % for tablets. The study by Draves and Walker is supported by many other studies, which confirm, that both the amount of the active substances, as well as the variance between the different active substances varies considerably from product to product, and even between different patches of the same product. Of course this variance would not even be worth mentioning if we were talking about a cup of tea or coffee, but when we are dealing with remedies and substances, which impact our serotonine, dopamine and norepinephrine receptors, when we are talking about serious conditions, or when we are talking about a substance which can cause severe, even lethal side-effects, it is an entirely different cup of teal all together. Mood Disorders, the Depressive Spectrum, Bipolar Disorder, and St John´s Wort. The most active substance in St John´s Wort, in terms of the treatment for depressive spectrum disorders, is hyperforine, but Hypericon Perforatum also contains a cohort of other pharmacologically active substances, which will not be accounted for in detail in this article. The intention here, is to tell those who prescribe St John´s Wort products, as well as users, about the fact that there are some serious issues which need to be taken into account, to explain what these issues are, why they are serious, and to advise, that those who prescribe the herb or use it, should involve a medical doctor or a clinical psychologist prior to subscribing or using it. Hypericine and hyperforin inhibit the re-uptake of serotonine, dopamine and norepinephrine in the synapsomes. Hypericine has a significant impact on the activity of the D3 and D4 dopamine receptors. Long-term treatment of rats with St John´s Wort remedies results in an upward adjustment of the post-synaptic 5-HT1A and 5-HT2A receptors. The beneficial effect of St John´s Wort on mild to moderate depressions is most likely caused by the interaction of these two effects. If it is indicated, that a patient is suffering from cyclothymia or bipolar disorder, I recommend not to prescribe/ use St John´s Wort, unless the use it is closely monitored by a medical doctor or a clinical psychologist. Also the treatment of patients with depression, who have never suffered from hypomania or a manic episode must be closely monitored. The use of St John´s could, potentially trigger the first hypomanic or manic episode in patients with a disposition for cyclothymia or bipolar disorder. In other words, frequent contact to a medical doctor or clinical psychologist are necessary, and particularly so, at the onset and the end of the treatment. The same considerations, which are necessary when prescribing or using a SNRI / SSRI product are necessary when using St John´s Wort too. The fact that medical doctors are over-prescribing those products is, of course, an entirely different matter all together. Plant substances are not necessarily more harmless than synthesized substances. Some of the most potent psyko-active substances and some of the most potent poisons are produced by mother nature. The effect on Metabolism and Interactions with other Medicines. Hyperikon Perforatum is effective at inducing hepatic CYPs, and in particular CYP3A4, CYP2C9 and CYP1A2. Hyperforine induces CYP3A4 through the activation of Pregnan X, which is a vacant nuclear receptor. Access Medicine (Access medicine, Mc Graw & Hill 2009)(3) and a cohort of other publications, draw attention to interaction with a long list of other medicines. These interactions must be taken into account before prescribing or using St John´s Wort. Some of these interactions are serious and even lethal. If a patient, for whom treatment with St John´s Wort is indicated, is on any other medication it is absolutely vital to avoid unintended interactions. I advise psychologists, psychotherapists and medical doctors alike, to urge increased professional as well as general awareness of both the beneficial and the harmful effects of St John´s Wort remedies. I also recommend, that St John´s Wort remedies, which are openly sold, should be marked with appropriate warnings about the potentially harmful effects, interactions and dangers, recommending the use of the product only, after previous consultation with a medical doctor or a clinical psychologist. If you should be suffering from a mood disorder and consider to use St John´s Wort, I highly recommend that you consult with your doctor first. Effectiveness in the Treatment of Depressive Spectrum Disorders. Even though the herb was used for centuries, any treatment that includes the use of St John´s should be considered as an experimental treatment, and all the necessary methodological and ethical precautions should be considered. The patient has to be informed about the treatments experimental character. If a patient is self-medicating, which in my opinion is fine, the patient should be offered all necessary and possible guidance and information about the beneficial as well as the side-effects and the risks which are involved. Too many health-care professionals are ignorant about which “alternative” medications their patients are on, and too many, honestly don´t care. A meta-analysis is not more reliable than the studies it includes, but it “can” give useful indications. One meta-analysis, about the use of St John´s Wort for depressive spectrum disorders, by Linde and Berner (Linde, Berner & Kriston 2008) (4) indicates that St John´s Wort remedies are as effective for mild to moderate depressions, as synthetically manufactured SSRIs, and more effective than a placebo. However, there were no double-blind studies with placebo used in the meta-analysis. An effect on severe depressions could not be registered, but also that coincides well with other SSRIs. Yes But ! Some Serious Considerations. Even though St John´s Wort seems to have relatively few side-effects, other than those which are common for most SSRIs, some of the interactions with other medicines, like unwanted pregnancies, and the rejection of heart implants are very serious. Taken these serious interactions into account, and taking into account that the herb is sold in over the counter products, I recommend that the manufacturers of St John´s Wort products voluntarily give detailed information together with the product, and that a recommendation to consult with a medical doctor or clinical psychologist is given. All SSRI / SNRI products must be taken with precaution and under professional supervision. Cognitive Behavior Therapy, adjustment in life-style, habits, thinking and nutrition often make any treatment with SSRI / SNRIs unnecessary. The fact that St John´s Wort can be bought over the counter can make people believe, that it is an easy, harmless, and inexpensive fix for a depression. It is not. Countless studies show that depressive symptoms tend to recur when treatment with SSRI / SNRIs is stopped. The treatment of mild to moderate depression with St John´s can cause the onset of a first hypomanic or manic episode in patients with have not yet been diagnosed with cyclothymia or bipolar disorder. It is also worth mentioning, that treatment with all SSRI / SNRIs requires a gradual increase of the dose at the start, and a slow and gradual teetering off of the medication. Failure to do so can worsen symptoms of depression. The best advise I can give to health-care professionals is, that St John´s Wort probably is as good or bad as other SSRI / SNRIs and that any treatment with it is experimental. The positive side of the herb is, that it could be an inexpensive and safe alternative to expensive pharmaceutical products if more research is done, the quality standardized, and the necessary care is taken. The best advise I can give with regard to St John´s Wort, if you consider it because you are feeling depressed is, seek help from a professional health care provider first and try Cognitive Behavior Therapy before you take “any” medication for depression. 1) Culpeper Nich. ”Culpeper Index of Herbs” Printed by Peter Cole, pp. 70 – 80 London, 1652, at the Sign of the Printing Press in Cornhill, near the Royal Exchange. This entry was posted in Health and Lifestyle and tagged Hypericon Perforatum, nsnbc health and lifestyle, St John´s Wort for Depression. Bookmark the permalink.